David Hinds of the Cleveland Volunteer Fire Department, gives A.A. Cole students an interactive tour of the firetruck and gear they commonly use to fight fires. 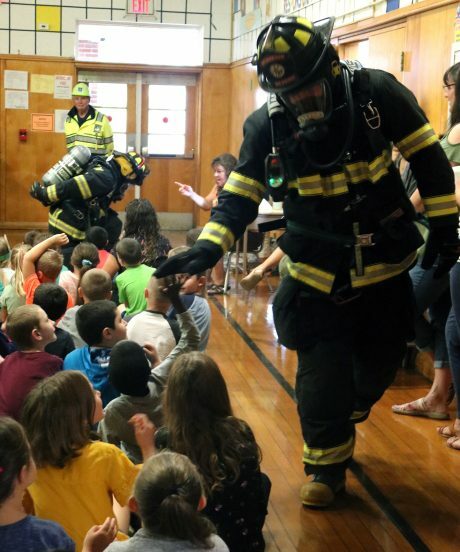 Firefighters from the Brewerton Volunteer Fire Department dress in full gear and mingle with students at Brewerton Elementary, so that each child can see how different they might look like during a fire emergency. CENTRAL SQUARE – The Central Square School District celebrated National Fire Prevention Week by bringing local firefighter and EMT personnel to the schools to teach students fire safety and prevention strategies. 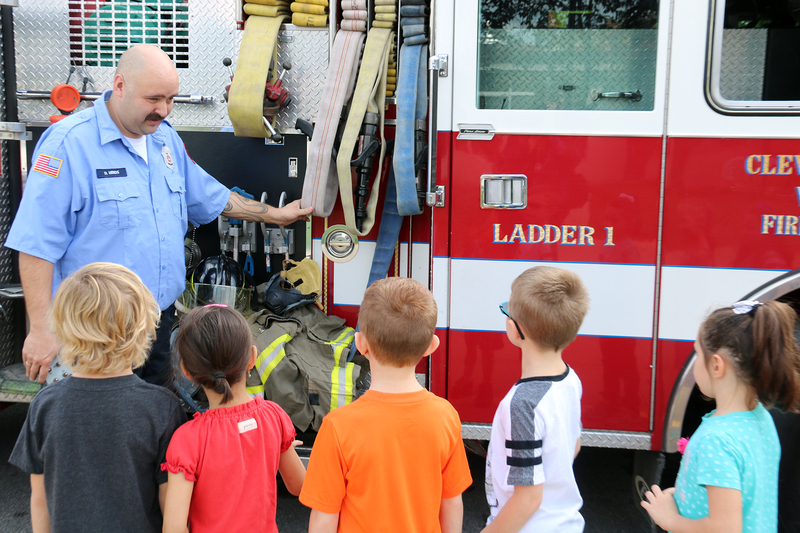 During their visit to the school, firefighters discussed how to prevent fires, as well as how to most effectively stay safe if a fire has already started. They urged students to work with their parents to look for places in their homes where a fire could start, check smoke detectors to make sure they are working properly and to design and practice a family escape plan with multiple exits and a meeting place a safe distance from the house. Firefighters even demonstrated how to properly stop, drop and roll if they were ever in a situation where their clothes were to catch on fire. In addition, several firefighters suited up in their full gear, to show the children what a firefighter might look like during a fire, so that they are less likely to be scared of one that is trying to help them. Since statistics show that four out of five U.S. fire deaths occur in homes, the National Fire Protection Administration continues to observe Fire Prevention Week in October every year. Their ongoing mission is to use the week to educate families on how to take steps to prevent fires and fire-related injuries in the home.